Also serving communities of Aurora. There are 7 Assisted Living Facilities in the Virginia area, with 4 in Virginia and 3 nearby. To help you with your search, browse the 4 reviews below for assisted living facilities in Virginia. On average, consumers rate assisted living in Virginia 3.0 out of 5 stars. Better rated regions include Chisholm with an average rating of 5.0 out of 5 stars. Caring.com has helped thousands of families find high-quality senior care. To speak with one of our Family Advisors about assisted living options and costs in Virginia, call (855) 863-8283. Virginia is located in St. Louis County, Minnesota, and has been dubbed the "Queen City of the North." Seniors in Virginia have 14 assisted living facilities from which to choose, four of which are located within the city itself and the rest are located in nearby towns. Assisted living facilities in Virginia, Minnesota - as in the rest of the state - are regulated by the Minnesota Department of Health and are checked regularly for adherence to certain rules and standards. The cost of living in Virginia, Minnesota is 15 percent lower than the Minnesota average and 13 percent lower than the national average. Seniors may find that the price of goods and services are cheaper here, making living in Virginia more affordable than some other cities. The crime rate in Virginia is extremely high. It is 131 percent higher than the national average. Seniors and other residents of Virginia have a one in 18 chance of being a victim of some type of crime, either violent or property-related. The Virginia area is home to world-class medical facilities, including Essentia Health-Virginia, in the event of medical emergencies or illness. The weather in Virginia, Minnesota is not ideal. While the summer months stay relatively comfortable, several months of the year only see highs in the low 20s. Many months get an average of nine inches of precipitation as well, which can make traveling or spending time outdoors problematic for seniors. The air quality index in Virginia is 25 percent better than the national average. The pollution index, however, is 85 percent worse. This could mean problems for seniors with lung conditions such as asthma or COPD. The state of Minnesota in general and Virginia in particular offer transportation options to seniors via the The Minnesota Board on Aging. This program exists with the goal of connecting seniors with people who will help them to get where they want to go, whether it be to the grocery store, the doctors' office or wherever else they choose. Whether a senior prefers a door-to-door ride service, public transportation such as buses, or rides from volunteer drivers, Virginia has something for everyone. Assisted Living costs in Virginia start around $0 per month on average, while the nationwide average cost of assisted living is $4,000 per month, according to the latest figures from Genworth’s Cost of Care Survey. It’s important to note that assisted living rates in Virginia and the surrounding suburbs can vary widely based on factors such as location, the level of care needed, apartment size and the types of amenities offered at each community. 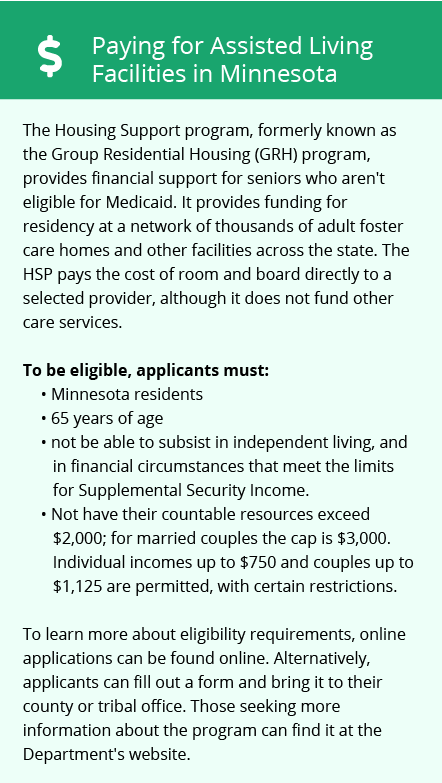 Eligible seniors can apply for financial assistance for assisted living in Minnesota via programs like Minnesota Medicaid's Elderly Waiver. This program helps seniors to pay for the costs of nurses, home care or assisted living. 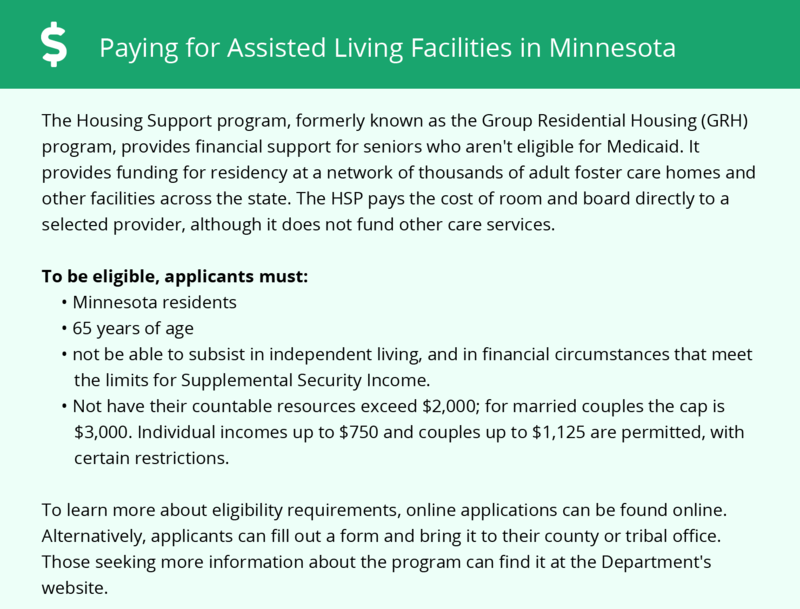 They may also receive assistance from state programs such as the Minnesota Consumer Support Grant (CSG). Virginia and the surrounding area are home to numerous government agencies and non-profit organizations offering help for seniors searching for or currently residing in an assisted living community. These organizations can also provide assistance in a number of other eldercare services such as geriatric care management, elder law advice, estate planning, finding home care and health and wellness programs. To see a list of free assisted living resources in Virginia, please visit our Assisted Living in Minnesota page. Virginia-area assisted living communities must adhere to the comprehensive set of state laws and regulations that all assisted living communities in Minnesota are required to follow. Visit our Assisted Living in Minnesota page for more information about these laws.